The pair NZD/USD continues to trade near a two-year low. Despite the weakness of USD due to the aggravation of the trade conflict between the US and the PRC, the instrument is under pressure. The US president warned about imposing duties on Chinese imports of $267 billion, which exceeds previous promises of $67 billion, and NZD is weakening due to the worsening of macroeconomic statistics, which is likely to cause a poor Manufacturing PMI release this week. Today, no significant macroeconomic releases are forecasted, but market participants are waiting for a response from China. Tomorrow Fed's Bullard speech is due at 11:30 (GMT+2). After that, at 14:30 (GMT+2), the US Department of Labor will publish data on Producer Price Index, and at 20:00 (GMT+2), the US regulator will comment on the current situation in the US economy. All the three issues are expected to affect the pair negatively. On the 4-hour chart, the price is corrected at the bottom of Bollinger bands. The indicator reversed downwards, and the price range remains wide, which indicates a further decline. MACD histogram keeps the sale signal. Stochastic does not give clear signals for opening positions. Resistance levels: 0.6557, 0.6612, 0.6657, 0.6715, 0.6760, 0.6806. Support levels: 0.6512, 0.6497, 0.6454, 0.6408, 0.6344. 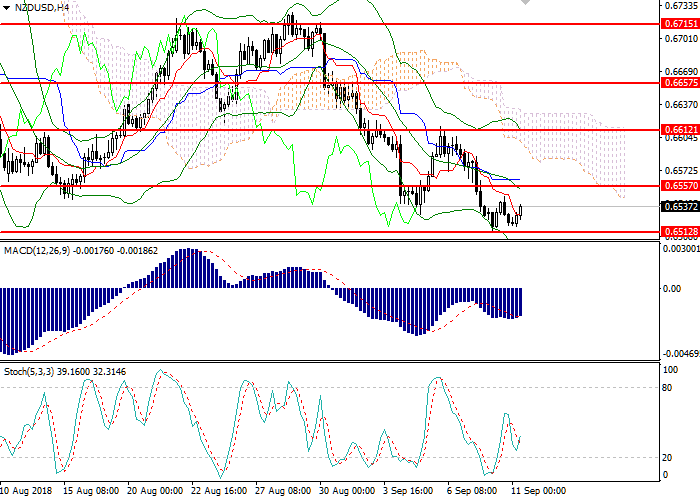 Short positions can be opened below the level of 0.6490 with the targets at 0.6425, 0.6400 and stop loss 0.6525. Implementation period: 2–3 days. Long positions can be opened above the level of 0.6570 with the target at 0.6630 and stop loss 0.6645. Implementation period: 1–3 days.